Columbus is on the move with the number of developments happening throughout the city. Public and private projects are all helping shape Columbus as a top-notch destination for visitors and locals alike. With everything that&apos;s new or under development in Columbus, we thought we should share all the ways this impacts visitors. Since there is so much coming down the pipe, we wanted to touch on a few that we think will be most interesting to our visitors. Hotel LeVeque, an Autograph Collection hotel, opened this year in downtown’s historical LeVeque Tower. The hotel features 149 boutique style rooms featuring unique collaborations with local companies. Courtyard by Marriott opened at Grandview Yard, just minutes from downtown, and adjacent to the 13,000-square foot Grand Event Center. The first-ever dual-branded Marriott property is being built near The Ohio State University. To be completed in September 2017, the new $50 million twin-brand Marriott and Residence Inn will feature a 240—room, full-service Marriott Hotel and a 114-room Residence Inn and include 12,000 square feet of meeting and event space. A 167-room Canopy by Hilton is set to open across from the Greater Columbus Convention Center in 2018. The hotel will feature a total of 3,000 square feet of meeting space, including a rooftop bar and outdoor patio. Smith Brothers Hardware Building is expanding with the addition of a rooftop patio and event venue, Juniper. The space will accommodate up to 500 people and will be the first of its kind in Columbus with exceptional skyline views. The official opening of the restaurant is October 17 and will be open Tuesday-Thursday, with private events only on Friday-Saturday. 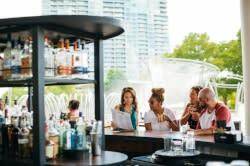 They can also make a semi-private space available for up 75-100 during restaurant hours. COSI, the Center of Science and Industry has entered into a first-of-its-kind partnership with the American Museum of Natural History (AMNH) for a new 22,000 -square-foot exhibit dedicated to prehistoric artifacts. A dinosaur gallery will open in late 2017, followed by rotating AMNH exhibitions beginning in 2018. 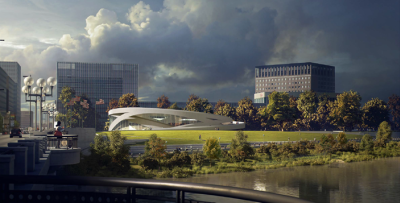 The National Veterans Memorial & Museum is currently under construction on downtown Columbus’ Scioto Peninsula, to be complete by mid-2018. This museum will be the only place where the stories of our veterans, their families and the Fallen – across all branches of service and all eras of conflict – will be told together. With more than 50,000 square feet, the Museum will feature a Great Hall, providing views of the Scioto River, as well as event and meeting space. The Columbus Zoo and Aquarium is building a brand new, state-of-the-art sea lion habitat. The Zoo has already begun designing how the new sea lion habitat will fit into its existing footprint and expects to break ground fall 2017. Although it’s too early to have a detailed layout of the habitat, it will have the same spaciousness and naturalistic feeling as some of the Zoo’s other habitats, such as Polar Frontier and Heart of Africa. The City of Columbus has begun a staggered streetscape improvement of High Street in the Short North Arts District that will enhance the visitor experience at the area’s 100+ restaurants, galleries and boutiques. There will be four phases of construction with Phase 1, from Vine St. to Goodale St. in front of the Greater Columbus Convention Center, is scheduled to be complete in November 2017. Access to business will be maintained throughout the construction process. Casey is the Sales/Development Coordinator for Experience Columbus, so she works with small meetings and also supports the Strategic Development department in advocating for Experience Columbus on a local level. Casey was born and raised in Columbus, but still finds new things to discover every weekend! She loves checking out the Columbus food scene and attending any and all festivals in the summer. You’ll most likely find her visiting newer restaurants in town like The Pearl or Columbus tried and true staples like El Arepazo (all 3 locations!) or Katzinger’s Deli. Then to work off all that delicious food, you’ll find her exploring Franklin Park Conservatory and Botanical Gardens or the Short North Arts District.